Harviestoun Brewery celebrate their 30th anniversary this year. I’m a bit of a fan of their beers; their Ola Dubh beer was my first ever Monster Beer post, and my first all grain homebrew was an attempted clone of their Bitter & Twisted. With Easter just around the corner, they’ve decided to do something a bit different. After a recent beer and chocolate pairing session, in which the favourite match was Harviestoun’s Ola Dubh 18 and a 75% Madagascar, Harvieston commissioned local artisan chocolatiers The Chocolate Tree to create some limited edition beer chocolates using that same combination. 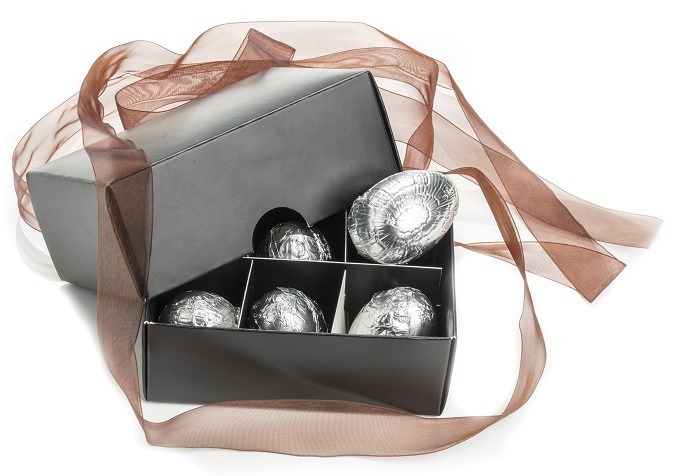 Only 40 boxes were made, each one containing 6 foil-wrapped eggs weighing about 50 grams. 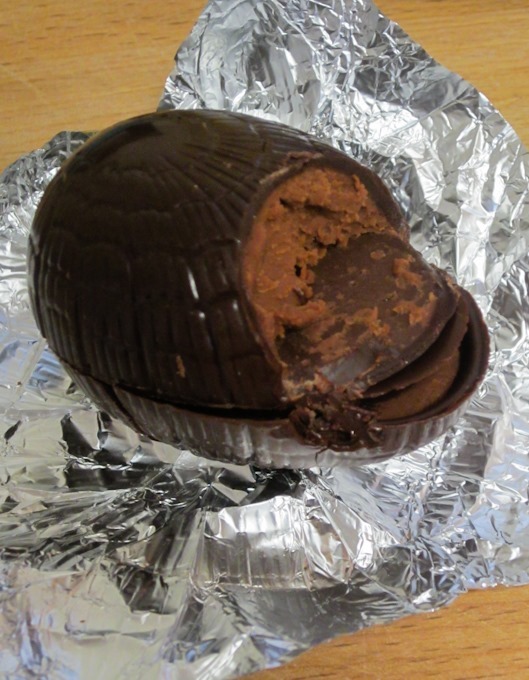 Each egg is actually two chocolates, consisting of a Criollo and Trinitario cacao shell around a soft centre made from the Madagascar mixed with Ola Dubh 18 beer. The signature fruitiness of Madagascar chocolate comes through beautifully, and the subtle taste of beer adds another layer of flavour. The eggs won’t be available to buy but you have lots of opportunities to win! Harviestoun have offered a box of their limited edition Ola Dubh 18 chocolate and beer Easter eggs to one lucky Pete Drinks reader. The prize includes free delivery within the UK. Leave a comment below, telling me what beer you would pair with chocolate. Like the Pete Drinks facebook page and leave a (separate) comment on this blog post with your Facebook user name. Follow @PeteDrinks and @HarviestounBrew on Twitter (if you’re not already! ), then tweet the (exact) sentence below. The deadline for entries is midnight GMT Saturday 23rd March 2013. The winners will be selected from all valid entries using a random number generator. 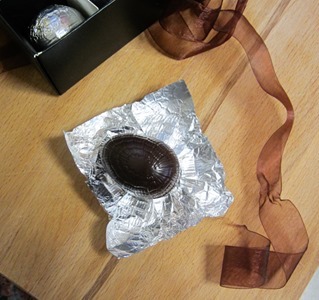 The prize is a box of Ola Dubh 18 Chocolate Easter Eggs and includes free delivery within the UK. The prize is offered and provided by Harviestoun Brewery. One blog entry per person only. One Twitter entry per person only. One Facebook entry per person only. You do not have to enter all three ways for your entries to be valid. For Twitter entries, winners must be following @PeteDrinks and @HarviestounBrew at the time of notification. For Facebook entries, winners must Like the Pete Drinks facebook page at time of notification. Harviestoun are also running a twitter competition. 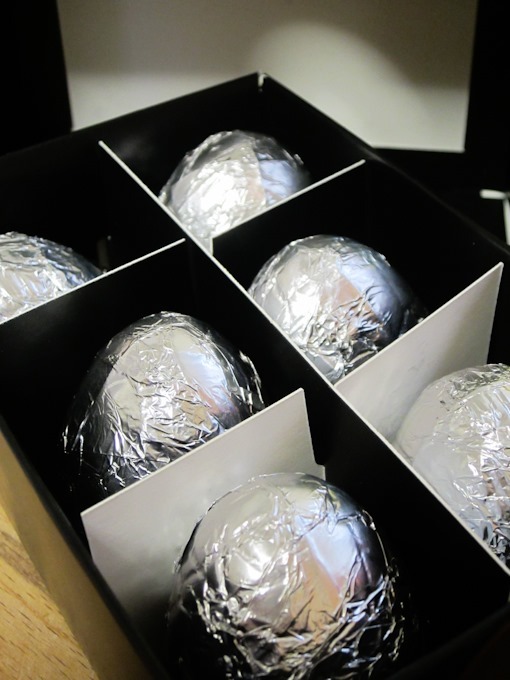 All tweets featuring the hashtag #OlaDubhEasterEggs between now and Monday 25th March will be automatically entered. There’s no competition on their Facebook page, but why not go ahead and Like it anyway for news about their latest products and projects? Pete Drinks received a sample of these tasty eggs from Harvieston Brewery! Bitter & Twisted for 2 reasons. 1) For a ‘lower alcohol’ option to complement these Ola Dubh 18s. 2) For the lighter flavour notes that would go down well with anyone I’m sharing with who is more of a mainstream, lager drinker. Of course, only a very special person would get a share :-). Oh, and the chocolate would be really dark and be served sightly below room temperature to get the flavours to build in my mouth. Sounds a perfect match to me! I would have either a Maui Coconut Porter or a pint of Camden Ink – both go well with chocolate! I’d pair them with Stortebeker Stark-bier, which is kind of a cross between a Dunkel Doppelbock and a Baltic Stout, and should balance it nicely. I’d pair the eggs with some Dark Star Imperial Stout a personal favourite at the moment. The beer has a slight orange nose which would pick up the fruit in the chocolate whilst being an equal partner to the rich qualities of the beer / chocolate combination. Indulgence … Just as Easter should be! I would be going an intense dark choc with a Belgian Framboise as there is nothing better in this world than choc and raspberries! Hmmm… chocolate… something fruity. Floris Mango. 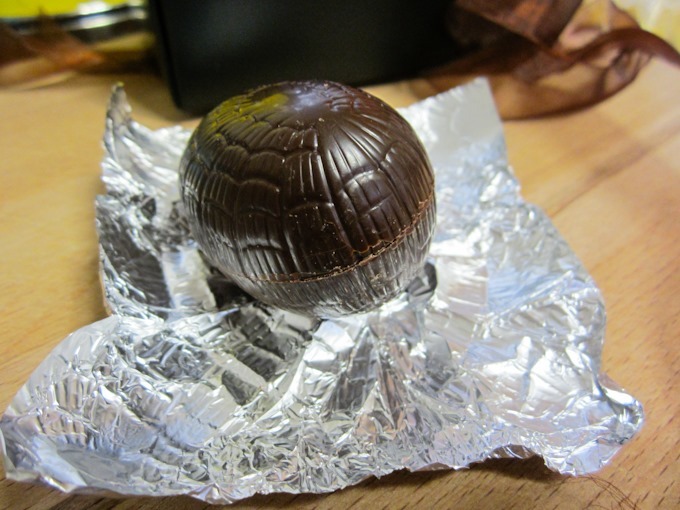 Mango chocolate. DELICIOUS. There is a company called Merry Berry chocolates and the choc is produced by beer lovers who make the chocs with beer in mind. So many wonderful choices including Cracked Black Pepper choc with a lambic Kriek; Aniseed choc with Titanic’s stout. Mixed fruit & spice with Fuller’s Vintage Ale. Lemongrass white choc with Taiphoon by Hop Back Brewery. And of course Ola Dubh beer with those choccies you listed above!